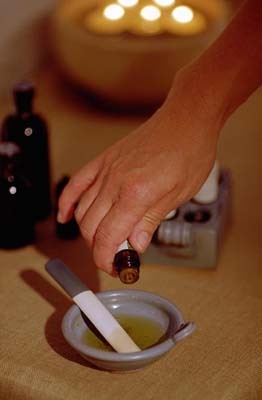 Aromatherapy can be a wonderful addition to your tool kit of healing modalities for your family. From the moment they are born, babies can enjoy the therapeutic effects of essential oils. Great caution must be taken though, as these oils are extremely concentrated and must be properly diluted before use. There are many essential oils which are not appropriate for use with babies. The essential oils mentioned here are safe for use with babies provided they are used appropriately. Essential oils are extracted most often by distilling seeds, flowers, peal, zest, grass, leaves, roots, and the wood of plants. Different parts of the plant give different oils; An Orange tree, for example, gives us orange from the fruit and neroli from the flower. Consider these cautions and storage guidelines when purchasing commercial aromatherapy products. Make sure they are tightly sealed in dark glass bottles. Keep them out of reach of children, poisoning can occur if ingested. Bathing – Disperse oils in 1/3 of a cup of milk then add to your baby’s bath just before turning off the taps. Inhalation- Add 1 drop of your chosen essential oil to your baby’s pyjamas, bedding or put it on a cotton bud and place in the cot. Oil burners and diffusers- Do not use a diffuser until the child is 4 weeks or older as a diffuser tends to ensure that every last molecule of essential oil is sent into the air and babies need a very gentle approach. You can put your chosen oil in a bowl of hot water and place this in a safe place, well out of reach of the baby and other children and then allow the molecules to gently escape into the air as the water cools so that not all of the molecules will escape. This will give a much more gentle fragrance. This is an excellent method when babies and children have colds. Electric diffusers are great to use all around the house when you baby is older than 1 month. To learn which oils to use for specific conditions please refer to the illness you wish to help in the Common Challenges of the First Year section. If you don’t find what you’re looking for, email julie@naturaltransition.com for suggestions. Where is the common challenges of the first year section?? Hi Sarah, I need repost it. Will have it back for you in a few hours. I just bought a diffuser for my son who is 13mos old 11mos adjusted. I decided to start an aromatherapy journey with him because of his upper respiratory infection. How many drops should I put in the diffuser for him? I’ve read that frankincense aids sleep.. so I’m just wondering if it is safe to use a few drops of this diluted with water in an oil burner for my 5 month old son? I was wondering if I can add the aroma oil into the water solution used in a humidifier? Sorry to take so long to reply to this, I missed it till now. Yes, you can. 1-2 drops works well and is a nice gentle way to use essential oils with babies. Yes, you can, this is a great way to deliver EOs. Follow the same principles as if you were using an oil burner. There is no need to increase the dosage but you may need to add doses of oil more frequently. You could top it up every hour or so if need be. Thank you so much for your great post Julie! I used to think that essential oils is just for adults but I am wrong. I wonder if there is any difference of ability to absorb aromatherapy between boys and girls even if they’re just babies. Your information will be really useful for me. Using milk to add EO while bathing the baby is a new idea, have never heard of it. My girl is 3+ , and I give her a massage of oilve and jojoba oil blend after bath, hope that is safe. Also I wish to know how the EO can be ingested, the amount and process for a toddler. Massage of olive and jojoba after a bath is great for a toddler 🙂 I’m not sure where you’re located but in Australia which is where I am, essential oils are only allowed to sold for external use only so I can’t give any recommendations for ingesting EOs. Using EOs internally is common in parts of Europe and here are some companies in the US that make and market oils for this purpose so there should be some useful information out there on the topic. I personally would not use essential oils internally with a child because they are highly concentrated and there have been cases of nuerotoxicty reported. I feel that there are safer ways to apply the oils through the skin (massage or bath) and lungs (inhalations) rather than the digestive system and I would choose one of those for a toddler. But… because of Australia’s restrictions on essential oils for external use only, I haven’t been trained in using them internally and my hesitancy in this may be unfounded. Thank for your share ! Just want to ask do we need to place a Diffuser far from our baby? Like put it in corner or somewhere ? Do you think the diffuser may harm a baby if we put it too close? A diffuser should go somewhere out of reach of the child. This is what I’m really looking for. Thank you so much for sharing. It’s very detail and useful, especially your cautions. My baby really like the eucalyptic flavor and it works well for her. And if you know anything about essential oil for pets, can you share it? Thanks again. Its a great recipe..thanks for sharing!!! I see you have eucalyptus listed as safe after three months, but I’ve read elsewhere that it should be avoided for children under 10 years. Which is correct? Are the risks (slowed breathing) being overstated? Thanks. At what age can lemongrass be safely used with babies and children? What side effects may occur? Which are the most dangerous effects and/or essential oils to avoid? Can you recommend the brands that sell the purist, safest oils? Consider the health of the family members before buying the right essential oil diffusers so that it could not harm any members of the family. Read its pros and cons of the product before buying one. Thanks for sharing the info, they are really helpful. I love essential oil and use it everyday for many purpose! This is a helpful guide. Thank you for including the ages and essential oils that are safe for it. Thank you for the wonderful article!!! What brand of electronic diffusers can you advise as most safe? I have an essential oil diffuser from Sage which tells me to put 10-15 drops into approximately 1 cup of water. Is this okay for baby of 7+ months? Should I be putting less drops in the diffuser? The oil is a mixture of grapefruit, bergamot, orange, lime, and mandarin. Thanks for your question. That’s a lovely blend for a baby, citrus are quite gentle oils. 10- 15 drops in one cup for a disfuser sounds quite good to me, I would start with 10 and see if that suits you. Increase it if required. I used breathe in a diffuser and i have a 4 month old is this okay for her. Can I use peppermint on my 3 week old baby? Can I use peppermint on my 3 week old baby? Is it ok for her to breath it in? Can you help me. Can infants over one month be used? Does it cause irritation or sensitivity to skin? Hi – my daughter is really congested and I have been advised to use Eucalyptus oil in a diffuser in her room. She has just turned 1. I have had conflicting advice on whether this is safe for her. Please advise. very happy to get this post. The whole article is all about the Aromatherpy and this information is really good for our baby health. We should read this article carefully and considered the tips which mentioned here. Hope, these tips are very useful for us.